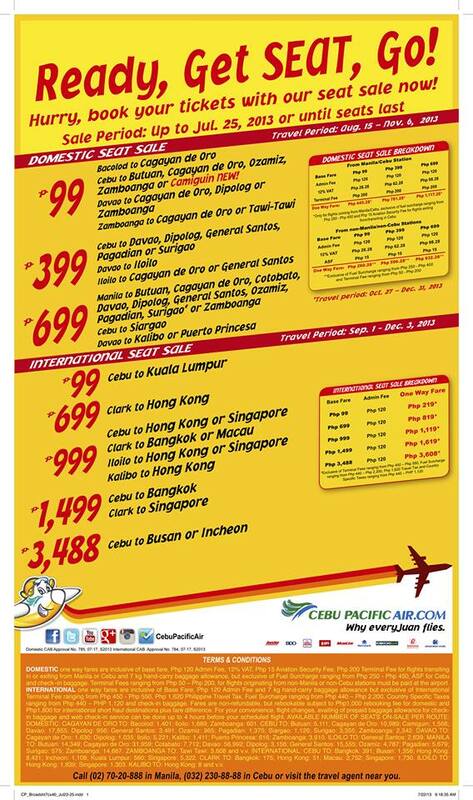 Cebu Pacific Promo Fares 2019 to 2020: Cebu Pacific Promo for the Upcoming 2013 Holidays! Cebu Pacific Promo for the Upcoming 2013 Holidays! Cebu Pacific Promo: Ready, Get SEAT, Go! Lowest fare starts at P99 up to P699. Please do check the photo above for the destination details. Lowest fare starts at P99 up to P3,488. This is your chance to visit Kuala Lumpur, Hong Kong at very affordable rates. If you plan to go to Bangkok or Singapore, could be a bit expensive but it's ok. Going to Busan or Incheon could be a lot expensive. What do you think? Hurry, book your tickets with our seat sale now! Just wanna ask if you have a promo seat for 8 person from Clark to Katiklan By Nov.11 to Nov.15 2013?? roundtrip please let me know as soon as possible please? ?